Damn, that gorilla is thicc and was 100% feeling his look. However, for some of the other animals, they thought they had been visited by their twin, and wanted to get closer to the animal behind the screen. 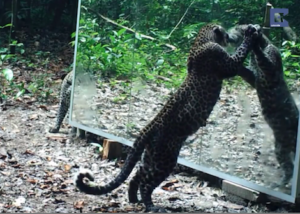 Obviously, this is impossible, as it’s a mirror and that’s pretty sad, as the poor leopard probably thought he had made a new friend. Enough of the emotion, because this was all done in the name of art and emotion has no place when a masterpiece is being made. French photographer, Xavier Hubert-Brierre, travelled to Gabon in Central Africa, with a gigantic mirror. 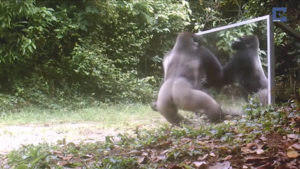 He wanted to create a short video that documented the wild animals and their reactions to this foreign object. Xavier and his wife looked for a clear area in the wild, and set up the mirror in an open space, ready to be found. They also set up their camera very discreetly so that the whole thing would be recorded, day and night. 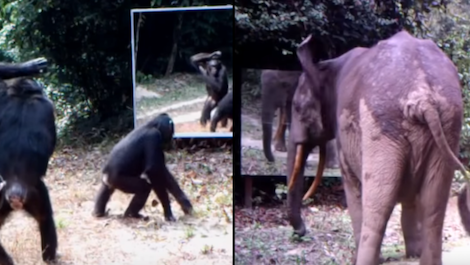 A range of wild animals found the large mirror, and the majority of them were quite confused. Especially the hogs, who were not only confused, but so very scared to their souls, that they quickly darted back into the wild for safety. Of course, there were many other animals documented over the two-part mini docuseries, but all of their reactions were so unique, that it’s hard to pick our favourite one. Xavier’s plan was a success and he has created one the best masterpieces that the wild has ever seen. Next thing, maybe introduce animals to the internet…. yeah, perhaps not. What do you think of the mini docuseries? Do you think it was a work of art? Which animal’s reaction was your favourite? Let us know in the comments, or on Twitter at @WhatsTrending.